A very heartfelt thank you to all of the amazing staff at Lost Creek Ranch. You put on an amazing show today! What a privilege it is to know all of the wonderful people and horses associates with this ranch. Your love for what you do shines bright on the faces of the riders and in the eyes of the horses. Thank you for all you do. When I was looking for a lesson barn for my daughter I reached out to Lost Creek Ranch, got an immediate response and she was invited to try a group lesson that same day! And that is how it is at Lost Creek Ranch, no judgments. They don't care where you come from, who you know, or what your experience level is, they are just happy to have you. 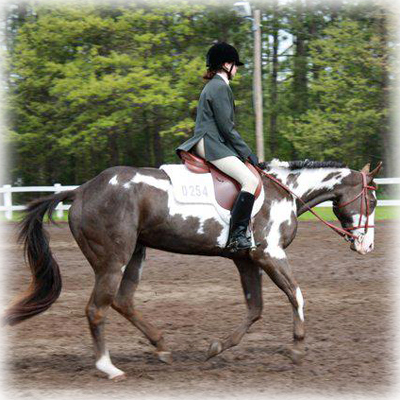 My daughter does the youth/teen camps, we both take lessons and I have sent my mare for training with Lynette. The environment is accepting, welcoming and laid back. I recommend them to anyone who has an interest in horses. Lost Creek Ranch is simply the best. I just wanted to take a minute and thank Lynette Weldon. Without her my riding would be nowhere. She gets me through the tough aspects of riding and showing horses and reminds me that showing horses isn't all about the ribbons and money. It's about building the bond you have with your horse and simply having fun. Thanks Lynette! I found Lost Creek Ranch and was inspired after my first meeting with Lynette. Lynette’s holistic approach to teaching and her incredible knowledge of horsemanship, horse communication and the therapeutic benefits of the human-horse relationship create an invaluable experience for students young and old. As a Licensed Clinical Social Worker, my profession is extremely rewarding but challenging. As a result, it is imperative as a responsible practitioner to apply various self-care techniques to avoid burn-out in this field. Lost Creek Ranch was and is the one answers for me. Lost Creek Ranch provides more than just horseback-riding lessons, the ranch gives each rider the confidence, skills, knowledge and the irreplaceable bond with some amazing horses that were given a second chance. 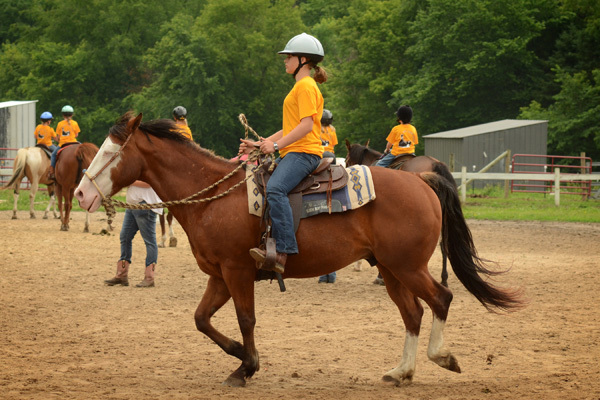 Encompassed in Lost Creek Ranch’s mission is the goal to provide at-risk youth the healing benefits and coping skills that therapeutic riding can provide. I hope you will consider donating to Lost Creek Ranch. Your money will ensure that the horses, the ranch and the clients will be able to partake in these incredible services throughout the year. 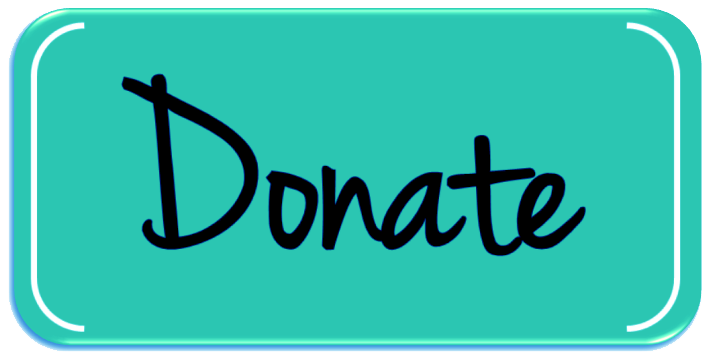 Your donation will support the health and well-being of the horses and the day-to-day operations of the ranch. Thank you for you time and consideration. Lost Creek Ranch is an incredible community of souls committed to providing a permanent home for good horses who somehow had been thrown away – destined for the kill pen, or otherwise judged as undesirable. I’d been career focused (obsessed?) for decades, waiting for the “right time and circumstances” to come along that would allow me to spend time in nature and learn riding, a dream that I’d had since growing up on a farm in North Dakota. Years, decades passed by, living in Minneapolis, working downtown. It finally dawned on me that there was no one preventing me from riding except myself. It was time. Lost Creek Ranch changed my life. For the last seven months, I’ve visited LCR weekly. Each visit was like a mini-vacation – and powerfully therapeutic, physically, mentally, and spiritually. At 50-something, I started out thinking I was probably too old – that riding was something for younger people. I’ve never been so delighted to be flat out wrong about something ever before in my life. Part of it is the horses themselves, just being with them in the gorgeous setting of LCR. The other part is Lynette and Ruth’s steady encouragement and education about horses that’s built my confidence and helped ensure my safety. I’m hooked. I’m deeply grateful to Lynette for her vision and passion for the welfare of these beautiful animals, and for creating such a welcoming and nurturing learning environment for all who visit the ranch. While helping at this ranch I feel that I part of something much bigger than me. This is not just some ranch trying to wrangle horses or a show barn obsessed with ribbons won but a thriving community within itself that seeks to revive the souls of equines and humans alike. The ranch opportunities may be local but the ideas are universal. I recently moved and I was going through my keepsakes like papers and things and I found the scrapbook I made at Lost Creek Ranch. In the back it said from you that I was very serious at was I was doing and that you could see me excelling more. I just want to know that you have touched me! Without you saying that I could do it I don't know where I would be. I have come such a far way and it all started with your guidance. Without you and your help I would not be showing at breed level and starting a colt. Thank you so much for all you have done! 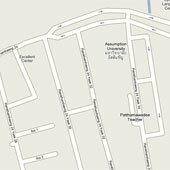 I just wanted to let people know about an AMAZING place.....where the worries and stress of daily life just melt away. Where you will find yourself amazed with what this place is all about and what it stands for. Where you will find a new friend that has no expectations of you....only unconditional love. I have found ALL of this at Lost Creek Ranch...Home of camp Confidence. This place has been a true BLESSING to Bill and I. We now lease a Horse named Moose who brings me so much joy and we have found a second family...Lynette, Ruth, Jennifer, and Cari and ALL the interns! If you are looking for a places to get away and believe that you are making a difference, I encourage you to go onto their website and check them out. The horses love the attention and Lynette is an amazing instructor if you are looking for lessons. Hope to see you there sometime! Julie & Bill , adult rider and our new "show dad"
I started to take riding lessons as a break from work and parenting but the ranch has become more like a rejuvenating retreat. Lynette, as an instructor encouraged me starting at the first lesson and pushes and explains just the right amount so I'm striving to do better but feeling confident in my current riding level. Lynette is willing to repeatedly answer questions about horse care, ground manners and "how do I do that again" questions. Her patience and love as a horse rescuer is unmatched and she willingly shares her knowledge and lets us help in the care of the newly rescued even when it is more work for her. My son, who has some special needs, also started taking lessons and I have seen his confidence rise and his eagerness to get to the arena for his lessons. He feels included in the group, is making friends and learning life lessons. Lynette is a patient teacher and will show how something is done over and over until he masters it but then will also hold him accountable to do it well once he has mastered something. The ranch, Lynette, the herd, and the other adult students are really a caring and fun place to be. Thanks Lynette. I was originally drawn to Lost Creek Ranch because of its mission to rescue horses but quickly realized they do much more than that. Everyone involved in working with the ranch are some of the most welcoming people you could hope to meet. As an animal science major it was a great place to use some of the skills I have learned in school but there were many things I learned through working with people who were always willing to lend a helping hand. I the instructor of the Little Buckaroos program for the youngest group of kids that come to the ranch to learn how to ride. I was able to meet a diverse group of people and learn a little about each of them as well as teach them about the world of horses and the ranch itself. The highlight of working with the Buckaroos kids was seeing the light bulb turn on when they learned something new and seeing how excited they were to come back and spend more time with the horses. In addition to the people, there is a wonderful group of horses living there. One of my favorite parts of working with the horses was discovering each of their unique personalities. It's inspiring to see how happy these horses are and how much they love to work with people considering some of the experiences they have had. In addition to the horses there is a band of dogs, cats and even a chicken that are always happy to greet you. Working at Lost Creek Ranch was a great experience. All of the people and animals alike will leave a lasting impression. Lynette and Lost Creek Ranch is making my girlhood dreams come true. I always wanted a horse and now as an adult I am living that dream. What makes this place so special is not just all the wonderful rescued horses but the people as well. I am in a wheelchair and have desperately been trying to find the right match for me because so many places aren't willing to take the risk because they can't see your potential. From day one, Lynette has provided an encouraging and positive environment. Where on my first day she said she'll let me do whatever I feel I am capable of doing and then when I know you can do even more I will encourage you to do so. So thanks Lynette, for helping me to live my dreams! ...one day I was reading the newspaper and saw an ad for a Horse Lover's Camp for Kids - called Camp Confidence - at a place called Lost Creek Ranch... it talked about how horse lovers could realize their dreams and have a 'horse of their own' for a week at camp. It talked about building self esteem and confidence and was geared toward children 7 - 14. They offered lessons and leasing, etc. so I gave them a call. What I got on the other end of the line was a woman who took the time to talk to me about my daughter, who listened and understood her passion for horses from the beginning. We decided to visit and do a "trial" lesson to see if it would be a good fit for us. With my previous experience looming, I listened closely to every word spoken. I watched the level of interest given to my little one. We have been to Lost Creek Ranch virtually every Saturday since that day - and that was more than two years ago! 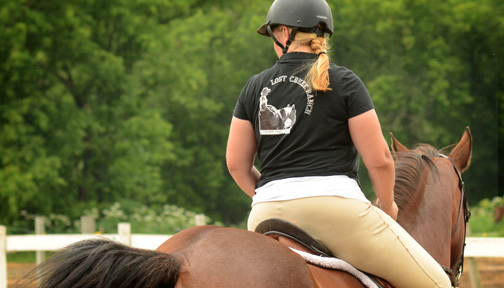 What Lynette offers is so much more than horseback riding lessons. She has given our family the ability to make Chloe's childhood dreams come true without us having to make a huge investment or a lifestyle change to support her dreams. After about 6 months of lessons, Lynette offered to take Chloe to a horse show. She now has been to 4. Chloe has been to Horse Lover's Camp - her first time away from home! We participated in a Mother/Daughter Day. We had her birthday at the barn spending the night in the bunk house used for camp. She is currently attending a horsemanship clinic where she is learning all about horses - how to care for them, groom them, the anatomy of horses, the difference in colors and breeds, how to lunge them, tack them up and turn them out. She's learning both Western and English riding and next wants to learn to jump! At Lost Creek Ranch, you can take horseback riding lessons from a kind, patient, knowledgeable and experienced horse woman - and you will love them. But if there is more in your heart's desire - or in the heart of someone you love - you can also make those dreams come true! I just wanted to take a minute to say again how much Lost Creek Ranch has meant to Mataya! She literally talks of little else! She is so excited to come back to Camp Confidence. She is participating in Young Author Night at her school this week. She didn't have to think about what to write about. Of course her book is about Lost Creek Ranch! Thank you so much for the work you and your staff do! My girls and I want to thank you again for a lovely weekend! It was truly perfect. You have a wonderful ranch and we felt so at home. The grooming, tacking up and riding brought me back to my childhood and reminded me how much I enjoy horses but this time there was the added joy of seeing my daughters love the horses. We look forward to returning for another weekend soon! The beautiful scenery and quiet of nature are just a few of qualities that bring us to Lost Creek Ranch for the past three years and many more to come. With no experience to begin with, my 10 year old son and I have learned how to care for and ride these wonderful, loving horses that thrive under Lynette’s care. My son has attended two summer camps with kids in his age group and then a first for us last year was a family retreat. Three families– 5 days in the bunkhouse – we had a blast!!! We have also gained more self confidence, learned to be more assertive, and overcome fears. Lynette is a wonderful teacher – kind, fun and patient. The love she has for her horses combined with her never ending knowledge makes all time spent at the ranch a rewarding experience. I have been partnering with Lynette and Lost Creek Ranch since the beginning of 2011 as a community service site for delinquent youth in our community. The Lost Creek Ranch is an extremely valuable resource youth in our community use to complete their community service hours. I have found it to be difficult to locate worksites for youth to complete their hours due to their delinquency. Lynette has been gracious enough to look beyond that and allow youth to come and work off their hours at the ranch. Lynette has a calm nature about her that the youth gravitate towards. Despite the hard work that goes into the upkeep of the ranch, many youth have commented that they enjoy coming to the Lost Creek Ranch because of the fun and relaxed atmosphere. Lynette has been fantastic to work with and Lost Creek Ranch is one of my favorite worksites for youth to complete community service hours. Call it a midlife crisis but one day I decided to learn how to ride horses at age 36. When I was afraid of the school horse who was almost as old as me I thought of running out the barn door and back to my city life but instead I signed up for another lesson then another then twice a week... Lynette's style of teaching is part loving encouragement and part drill Sargent and she instinctively knows which is needed. What I have learned at Lost Creek Ranch is more than good horsemanship: I have learned to be patient with myself . I have learned that being loved by a horse is well worth the hour long drive. I have learned to get dirty and not care (very much). I have learned that there is nothing more freeing than cantering in an open field on a sunny day and most important I have learned that every horse no matter how old, frightened or sad can be transformed when they come to Lost Creek Ranch and become part of Lynette's herd. *** Testimonial Update: I have been in lessons with Lynette for over 3 years now and I have learned more in that time than many riders/ horse owners learn in a lifetime. Not only is Lynette's knowledge about the care of horses strong but her ability to train is second to none and she is willing to share that lifetime of knowledge with anyone who wants to learn. She has opened up a whole new world to me by teaching me how light a horse can be and allowing to me to learn on her own horses as well as assigning me training project horses and allowing me to make mistakes and figure it out and fix it rather jumping in to fix it for me. I will always be grateful for her as my mentor. When learning to ride and train with Lynette there are times of total frustration where you feel like nothing is working and as a rider who likes to show I get competitive and feel like my horses are "falling behind" but in the end I have learned that listening to Lynette and being patient pays off and letting the horse dictate the timeline not the show schedule results in a solid horse with no "holes" in his training. Ruth, adult rider, proudly owned by her sassy mare Millie and her her black beauty Mickey.